I've got a new AMD R1800X rig but am for now keeping my GTX 770 graphics board. My video is 2560x1440. Asus Crosshair VI Hero mobo, stock clocks, Windows 10. Below are links to the results I'm seeing in the Ashes Escalation "CPU" benchmark. Amazingly, I can't find other web posts with good comparative results. They are all either at 1920x1080, focus on the GPU, or came out much earlier before optimizations etc. Anyway... I'd appreciate it if someone with a 2560x1440 monitor and comparable CPU (R1700 or 1800 class) could run the CPU benchmark and post results. Those numbers look too low, a 8370 has higher #'s. Isn't the 770 the bottleneck? I don't yet know if I have any problem - waiting to see comparable results in these CPU-focused tests. I *thought* the Ashes CPU-focused tests were designed to remove GPU dependency and just report what the CPU could do. Anybody know about that? If my GPU is the problem I can eventually replace it. But now I'm trying to see if the non-GPU parts are performing as they should. I think your CPU framerate looks fine, it's 22FPS higher than my own http://imgur.com/a/VDG0e. I know it's not a Ryzen CPU, but it's still a pretty decent one, it was running at 3.85GHz. @bb - Thanks for posting your results which, I agree, indicate that my CPU is doing all it can. That's what I really wanted to know. It's interesting to see that your 'average' and 'cpu' framerates are identical, whereas on my system the 'average' is much lower than the 'cpu'. I'm guessing this means that your GPU can meet or exceed the CPU, and mine can't. I'd still be glad to see a CPU-focused benchmark with a Ryzen CPU for comparisons, if anyone can do that. Here's a benchmark from my Ryzen 1500X that I have overclocked to 3.9Ghz running 2666Mhz RAM. Yep! That's why they post the 'average frame rate' and 'average cpu frame rate.' In games the CPU feeds the GPU essentially, so they can calculate the frame rate minus whatever the GPU performs at, and that's the 'average cpu frame rate' scores. That's what your CPU scores regardless of the GPU in your system or the resolution you are playing at. The GPU bound test does this as well. Looking at your GPU bound test we see your CPU was able to perform an average frame rate of 93 FPS, holy smokes that's fast! Whereas your average frame rate (after the CPU sends draw calls to the GPU) is only 23 FPS. Your computer is severely GPU limited in Ashes. To meet your Ryzen 1800X in Ashes you'll want an RX580 or one of the new Vega GPUs in your system. I've found that Ashes does better with AMD cards, better performance and less crashes. 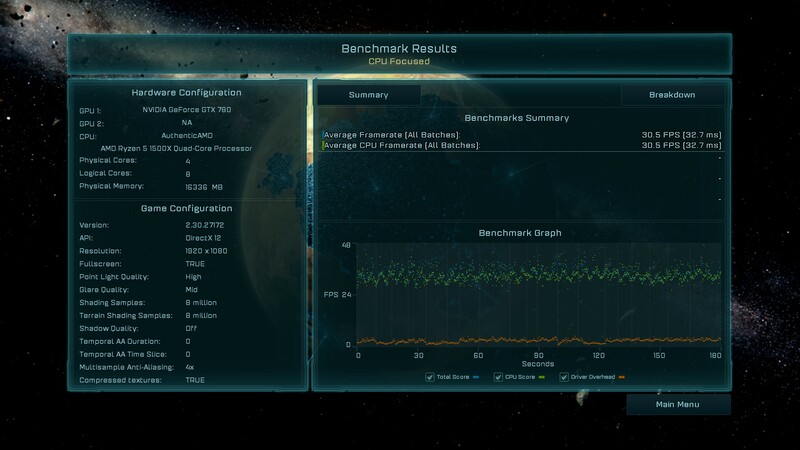 Just ran and posted 3 Ryzen 1700 benchmarks with a 1080 ti - the "windowed Vulcan" one is in the top 10 on 1440p Crazy on the benchmark leaderboard (90something FPS), the other 3 (windowed DirectX 11 and both Vulkan and DirectX 11 full-screen) were at around 60. This is under Win7 with the current something.41 NVidia drivers, STOCK clocks on a Gigabyte Aorus 1080ti, and the 1700 is mildly overclocked to 3300 Mhz I think. You need a serious GPU upgrade before you're going to come close to limiting out your CPU - if you're running Windows 10 a PAIR of RX 470/480/570/580 or a GTX 1080/1080ti would probably be the way to go, even a GTX 1070 or a SINGLE RX 480/580 would be a major upgrade. For perspective, your GTX 770 specs out between the GTX 1050ti and the GTX 1060 3GB in the current NVidia lineup - more cores but a LOT lower frequency - and somewhere in the ballpark of the RX 560 or possibly even the 550 on the AMD side but that's harder to judge as "cores" don't match up well between NVidia and AMD on most usage. What I'd like to know is why Ryzen does not show up on the "more options" "CPU" menu on the benchmark leaderboards. I get 31.3FPS for the average CPU framerate on an i7 4790k so your CPU framerate is very high.